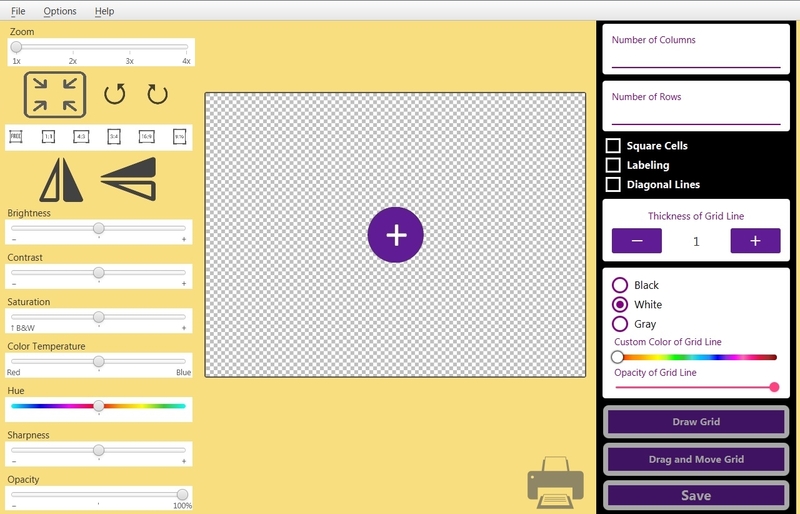 GriDraw ®* is an Image Editor for Artists, a desktop software for Windows, macOS and Linux. It features a simple and practical user interface with support for creating the grid over the reference photos for the Grid Method that many artists use. 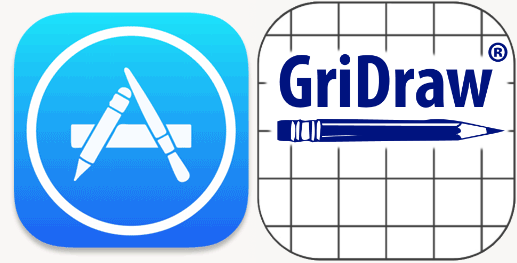 GriDraw has two workable panels: the Image Editor on the left side and the Grid Drawing Tool on the right side. 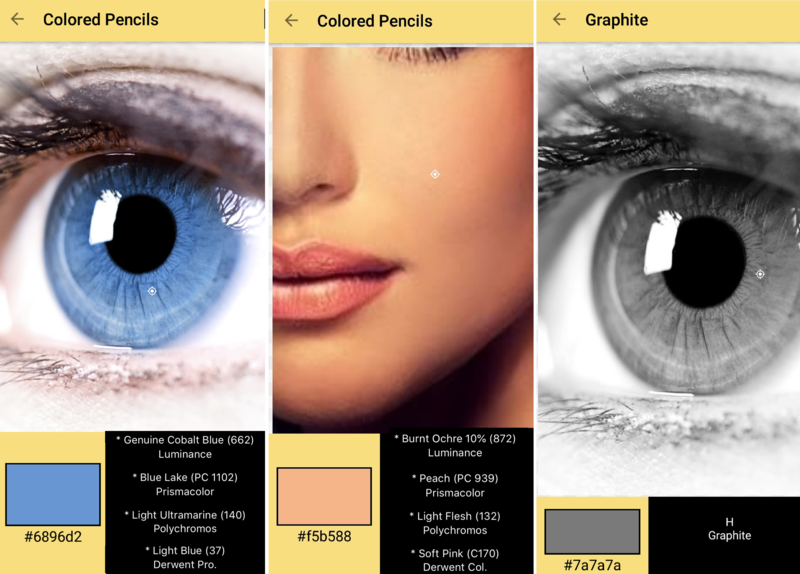 GriDraw was originally created by pencil artist Jasmina Susak as a mobile phone app and has evolved from a simple grid-drawing tool for Android and iOS apps into an image editor with support for cropping, resizing, transparency, saturation, brightness, contrast, hue, color temperature, flipping, rotating. 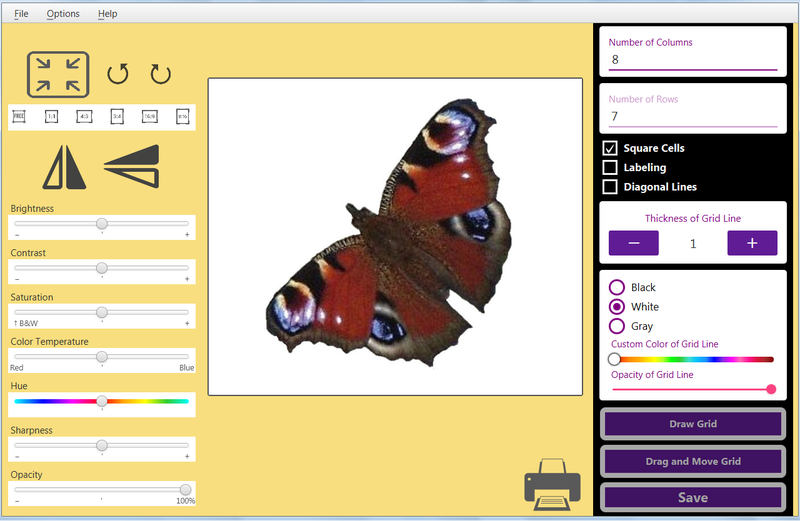 It also has Save and Print features even without the placed grid; therefore, GriDraw can be used solely as an image editor. The features of the grid-drawing tool on the right side meet all the requirements of the artists when it comes to placing the grid over the reference photos even the labeling and diagonal lines. The created grid is movable so that it can be placed in the desired position over the reference photo. The color, thickness, and opacity of the grid lines can be set as the artists need and desire. Download and install this software and prepare your reference photos for drawing or painting within a couple of seconds. The Grid Method is an easy way to transfer the outlines of the reference photo to your drawing paper or canvas. It is important to have a good sketch before we start to color because color erasure always results in paper damage. Even graphite, particularly HB and darker, cannot be erased completely. So, our sketch must be proportional and accurate, and our paper or canvas unharmed before we start to add the colors. For this purpose, the famous artists from the Middle Ages have found the Grid Method, and they used it to create their proportional paintings and drawings. Of course, they didn't have reference photos, but they used physical grids through which they looked at their models while drawing on their gridded paper. In the next drawing, you can see Albrecht Dürer working this way. Many other Renaissance artists, even the great Leonardo da Vinci, used the Grid Method. The grid divides the original image into smaller, manageable pieces so that you can more easily see where to place the main lines. The process of using the Grid Method helps you to improve your drawing and observational skills so that you can learn to draw freehand by practicing with a grid first. Some advanced artists use only two or three lines of their grid because that is just enough for orientation. If you're using the Grid Method, your sketching can go much faster, and there's much less erasing, so your paper stays smooth and clear. As you progressively become more comfortable, you can make your grid squares slightly bigger. This will lead you to a more freehand drawing. Keep increasing the size of the grid squares, and eventually, you won't be needing a grid at all. Before you place the grid over your reference photo, you can edit it with the tools on the left panel. You can resize it, crop it, rotate it, or flip it. Furthermore, you can modify the brightness, contrast, color temperature, hue, and sharpness. There is also a feature for decreasing opacity, which is rarely found in other image editors. When you save the image as a .png file and place it over another photo, you will see the other photo through it. You can also use the "Saturation" feature for creating a black-and-white image by decreasing the saturation to zero, moving it to the left side of the scale where the "B&W" sign is found. Note: You can edit the image even with the grid placed over it. Now it's time to place the grid. Decide how many columns and rows you want, and type the numbers respectively. The best option is to check the Square Cells option to get the perfect square ratio of 1:1. If you create rectangles (when the Square Cells option is unchecked), you will have difficulty in drawing rectangles of the same ratio on your paper, and your drawing will be elongated. When you have checked Square cells, you will only need to type either the number of columns or the number of rows to create the perfect squares. If you want to use the labeling feature for better orientation, check the Labeling box. It will mark the marginal cells with letters and numbers. They will have the same color and opacity as your grid lines. Many artists like to add diagonal lines in their grids in order to create even more precise outlines. Thus, this feature is also included in the GriDraw. Likewise, the diagonal lines will be of the same thickness, color, and opacity as your grid lines. Check the Diagonal Lines box if you want to add them to your grid. Indicate the thickness of the lines by pressing - or + or by typing the number of pixels in between these signs. The best thickness is up to 5 pixels, but this will depend on the dimensions of the reference photo. If you have a large image, for example, 6000 px x 4000 px, even a 5-pixel line thickness wouldn't be too thick. You can see the real-time changing in the image panel as you click - and + and chose what looks best for you. Next, choose the color of the grid. You can opt for black, white, grey, or any other color, and find the most suitable for your reference photo. If you want to see a bit through the grid lines, you can decrease the opacity of the grid lines. After this, you can adjust the position of the grid on the reference photo. This is the option that many artists ask for, so it was a must-have option to be included in the GriDraw. Click on the Drag and Move Grid button to enable the grid to move. Drag and move it to the desired position and then click OK.
Now you can save and print your gridded image. You can click the print icon, and the GriDraw will print the image, even without saving it first. Next, draw the main lines from the squares of your reference photo to the squares on your paper or canvas. To do that, you will have to create cells of equal ratio, using an HB, or softer, pencil or mechanical pencil. If you have a small reference photo and want a bigger drawing, just make the squares of your blank paper two to three times larger than those over the reference photo. Don't press too hard because you will leave impressions on your paper that will show up after applying your pencils on top, so keep the pressure light. 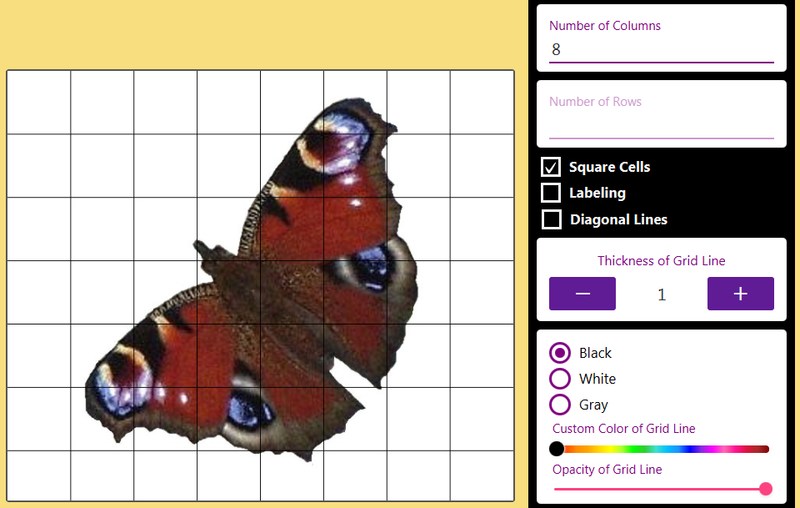 Label the squares on your drawing paper in the same way as on the reference photo created with the GriDraw. Note: If you don't want to draw the grid lines manually, and if you plan to use colored pencils or make a graphite drawing without many highlights, you can open a blank page in GriDraw, create the grid with the same ratio as the reference photo, and label the cells. It is important to reduce the opacity as much as possible (but not completely) and use a light grid color. You have to make the lines hardly visible, yet visible enough, so that you can see and draw over them. You will be able to cover them with colors anyway. 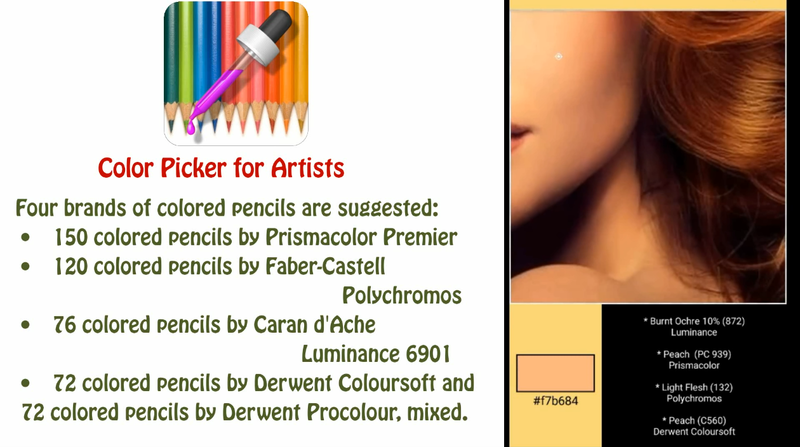 In the case of a white background, you can cover the lines with white markers or gel pens. Experiment with colors, thickness, and opacity on the blank page in the GriDraw to see which combination is the least visible. Finally, you can print out the image, having a grid that is hardly visible, yet functional. This way you save time over drawing the grid with pencil, you don't damage the paper in your effort to erase the grid lines, you get the perfect grid, and you can already start to work. At the end of the drawing, you can simply either cut off the labeling or color over it. It is important to print it out on the quality paper you use for drawing and not on a regular printing paper. However, it is not recommended when you want to draw pale skin, for example. In this case, the second option (if you don't want to draw the grid lines manually) is to print fully visible, black grid lines and place them under the drawing paper. The grid lines will be visible enough so that you can transfer the outlines to the paper, and the paper won't be damaged because there won't be any need for erasing the grid lines. Now you can finally begin to create the outlines. Pick the box from which you would like to start and find the corresponding box on your gridded paper or canvas. In the next image, you can see the starting point being the box E2. 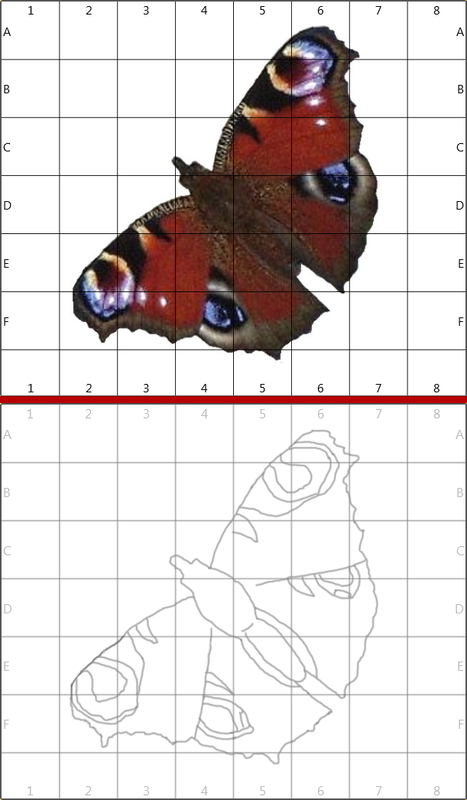 The curve of the butterfly's wing is drawn in the box E2. Follow the outline from box to box, using the marginal labels to help you know where you are. Look at where the outline starts and ends in each box. Focus on getting the placement of each line just right and concentrate on one single cell at a time until the entire image has been transferred. Try as much as you can to copy exactly what you see in that little square on the photo to the corresponding square on your paper or canvas. In the case of this butterfly, the exact copy is not that necessary, but when we draw portraits, we want to make them recognizable, so copying the lines precisely and placing them right are crucial. Now you can begin adding the inner details if you need them. Pay attention to the labels and draw the details in the same manner as you drew the outlines. Focus on a single cell at a time and transfer all the details you need into the cells of your paper or canvas. Erase the grid lines and start to color or paint. Enjoy creating your realistic, proportional artworks! 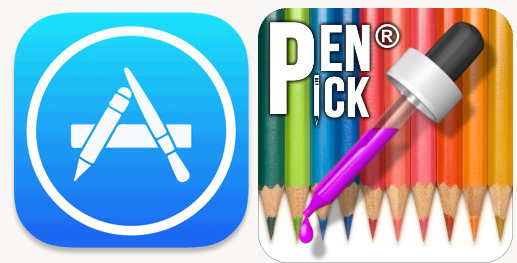 Download our Color Picker for Artists app, pick a color from the reference photo, and the app will suggests which colored and graphite pencil to use. * GriDraw is a registered trademark in the United States.